Alister McRae in the Vantage Subaru WRC on his way to becoming the first international driver to win the Ashley Forest Rallysprint. PHOTO: GEOFF RIDDER. The Vantage and Subaru team celebrate the win at the finish line. PHOTO: GEOFF RIDDER. Alister McRae and co-driver Nick Taylor with the winner's trophy from the Ashley Forest Rallysprint. PHOTO: GEOFF RIDDER. The Vantage Subaru WRC sprays dust as it roars off the start line on its way up the 1.7km, 55% uphill and 45% downhill course. PHOTO: GEOFF RIDDER. The Vantage Subaru WRC rounds the hairpin bend at the top of the course. PHOTO: GEOFF RIDDER. 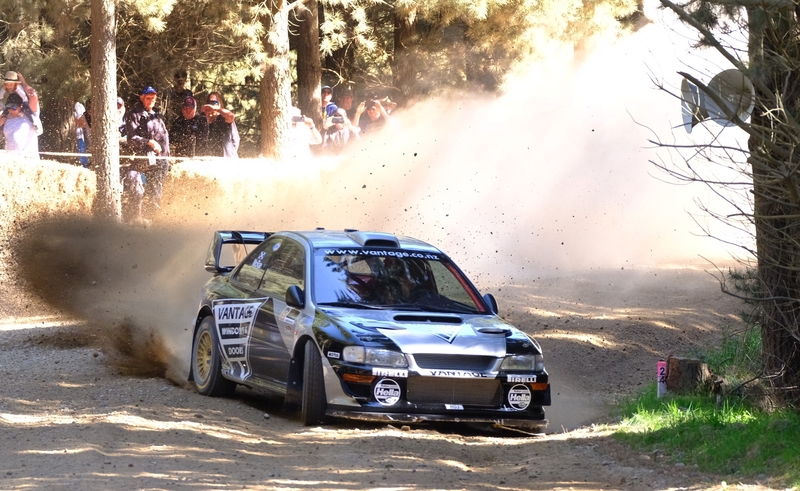 Australian-based Scotsman Alister McRae won the Ashley Forest Rallysprint, in North Canterbury today, in the 1998 ex-Possum Bourne Vantage Subaru WRC - becoming the first international driver to claim victory in the event’s 35-year history. The elimination-style nature of the rallysprint, which featured a 55% uphill and 45% downhill 1.7km course, saw McRae go first in the top-two run off. He clocked a 55.35secs time and the large crowd waited with bated breath as his challenger Blenheim’s Neil Webb charged off up the hill in his mighty Mitsubishi Mirage, with Evo running gear. Webb, who had his son Jack on-board as co-driver, managed a very credible - but not fast enough to win - time of 56.04secs, which saw the Vantage team and Subaru supporters erupt into celebration cheers. McRae says he was “over the moon” to take out his fourth victory on New Zealand soil, after claiming the winner’s trophies at the 2015 Race to the Sky, plus the 2016 and 2017 Leadfoot Festivals. His last crack at at the course was not perfect but it was sufficient for victory. “The final run, it’s always difficult because you don’t want to make a mistake and I felt that a little bit. We had a really good run to the top but the second-to-last corner coming down, it jumped out of gear, so we dropped a bit but not too much time,” McRae says. 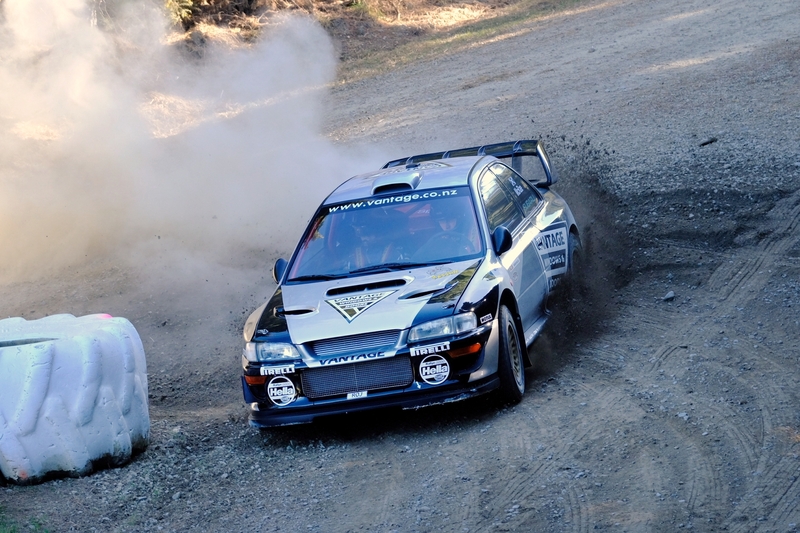 The spectators had been expecting a three-way fight for the win but defending champion Sloan Cox was out early on Sunday when the hydraulic pump failed on his centre diff, causing his Mitsubishi Evo X Hillclimb Special to lose 4WD and spin out on a corner. Getting back up to speed bled out time and he wasn’t quick enough to make it through to the top 16. Hayden Paddon was fresh from a podium place at WRC Rally Turkey and his Hyundai i20 AP4 ++ had consistently set the fastest times over the two-day event. Devastation struck on the top 8 run when the car’s oil filter popped off and he lost engine power, eventually limping across the finish line. It meant the pressure was off McRae and co-driver Nick Taylor and the left-hand drive factory Subaru got progressively faster as it whittled through its competition on the top four run-off to gain a place in the top-two final. Taylor has a close connection to the man whose company bought the Subaru from Prodrive after Bourne’s death in 2003, Vantage principal Craig Vincent. The Auckland-based 22-year-old is Vincent’s daughter Margot’s boyfriend. Selected for his slight build, Taylor was the perfect passenger to lighten the load for the Subaru. As is always the case for Vincent, who was Bourne’s co-driver for a number of years, it was very special to see the 20-year-old Subaru WRC car still capable of glory. “It was really quite amazing to come down here for our first time and for Alister’s first look at the hill to come away with the win. It was outstanding. I want to give a big shout out to the team for all the effort they put in and all the support we get from Vantage our team, Speedhub for the car, Pirelli and Subaru. It’s a great effort from everyone,” Vincent says. The passionate Vantage pit crew team of Paul Hayton, Chris Kitzen, Mike Thompson and Chris Coleman – many of whom worked on this car and with Bourne over 15 years ago, never doubted the result today. They worked efficiently and competently on the Vantage Subaru to ensure the old motorsport adage: To finish first, first you must finish. The late, great Kiwi rally driver never won this rallysprint in this particular Subaru but Bourne did claim victory in this forestry block event near Rangiora in 1989, 1991 and 2000 in three different Subaru models. As his last two events in the Vantage Subaru have been held on tarmac, McRae was thrilled to be back driving it in gravel specification, as it bought back fond memories of powering up the Cardrona Valley’s Snow Farm access road to Race to the Sky victory three years ago. The car was running the same Subaru 2-litre Boxer engine that it uses at Coromandel’s Leadfoot Festival but with smaller brakes to fit the gravel tyre rims. The big difference for this weekend, was the brand-new 2018 WRC suspension. The challenge for McRae coming to this event for the first time was always going to be lack of knowledge of the tricky rutted, pot-holed course. Before the qualifying runs began on Saturday, he had one recce look at in a convoy, in a road car and he also walked up and down it taking notes. “Just to see what it was all about. The first run for me is to see the road and get a feel for what the car is doing,” he said on Saturday after laying down a 1min:04:51secs time on his debut attempt. In between defending his Leadfoot Festival win in February and competing at Ashley Forest Rallysprint, McRae has been doing demonstration runs at international events, including the Goodwood Festival of Speed and Race Retro in the United Kingdom. Nothing with a stopwatch. Consequently, he spent Saturday getting his head around wrangling the wickedly-powerful Vantage Subaru WRC. “It’s a seriously-quick car. It takes you a few runs to get used to the speed,” McRae says. His conundrum was getting all of the 760 horsepower to the ground on the dusty, gravel course that features a hairpin turn at the top of the hill. The 1998 ex-WRC car doesn’t have modern technology like launch control, which would help boost it off the start line that was increasingly bedded down in a deep rut. The Vantage Subaru does have anti-lag to keep the turbo boosting when McRae’s foot is off the throttle but because it runs a much bigger BorgWarner turbo - than it was built to run back in its WRC days when its maximum output was 350hp - there is sometimes a tiny lag between when he is on and off the throttle. Regardless of the fact that it is a 20-year-old car, McRae came tantalisingly close to beating the record time of 54.96secs set by Cox last year and he says that it perhaps leaves him with some unfinished business.